So far so good Review by Jason "Jason B"
I was really hesitant about these cards. But after thorough testing, they seem to be holding up fine! I formatted it right away in camera and its been rocking ever since. 4K approved on the Canon 1DC. Shot 20 min straight with no problems. Camera warmed up but its said to do that with 4k recordings in general. Was weird that it was shipped in a large 11x14" padded yellow sleeve. Thats weird because it was just the card in a small clear standard memory card case inside. No paper work, no nothing. This card is amazing, On CrystalDiskMark 4K Sequential test I get just over 100mbps read and 200 write. The item ordered was a CF card: Komputerbay Professional 128 GB CompactFlash 1050X. One of the fastest card you can get for money. I've been using these cards in a production environment for the last few weeks, running magic lantern RAW video on my Canon 5d MKIII. They run great, full 1080p @ 30fps and the storage size is great! Being able to shoot most of the takes on one card is such a time saver. A little tweaking with the camera settings, and running the latest builds gets the most out of these cards. One gotcha though: you have to have a newer UDMA 7 compatible card reader, or you won't get the rated performance. Make sure to format ExFat, and you are good to go! Set picture size to raw off, and jpg small in the canon menu. Run the hacks in ML if you need more performance. I get better performance with live view ON. UPDATED: When I originally posted the review below I did not receive a response from Komputerbay by email or when I tried contacting them by phone. Before sending back the card I decided to call one more time and when I did get an answer things worked much better. Here is my update. After using the July 22 build of the ML RAW nightly builds and going through the steps described to me over the phone with Komputerbay customer service; I have been very pleased to say I have experienced no dropped frames with the following exceptions, which I should point out are not the fault of the card but the nature of bleeding edge software (that is still amazing) just an FYI: When there is less than 1gb of card space left or if I start my recording while in a menu. I began shooting with the ML RAW using a 5D Mark III around mid June. I tested the SanDisk Extreme Pro Cards and Lexar 1000x Cards. Both performed very well and because of higher write speeds I purchased some Lexar 1000x Cards with limited storage capacity over the San Disk Extreme Pro. I purchased the smaller capacity cards with the hope that the price for faster CF cards would eventually come down. It wasn't until KomputerBay released their 1050x cards I thought I may give them a shot, as previously they did not seem to have the write speeds or consistency necessary for ML RAW. 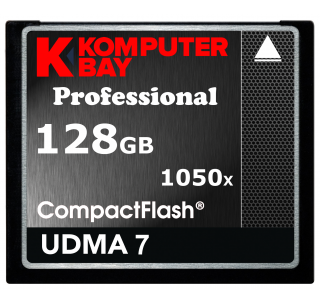 After shooting with the new KomputerBay 128GB 1050x card for the past three days I am disappointed. It is clear that it does not perform as advertised. Write speeds under 75 mb/s this card can handle OK, but will still have some drop outs. More importantly, anything above that and you will frequently experience multiple dropped frames (So if you plan on shooting 1920x1080 24fps or higher this card WILL NOT work for you). Advertises 100 mb/s write speeds <--- this is not true for the card I just received; in fact, I was unable to capture sequential clips without dropped frames when shooting 1080p. This has never been the case for my Lexar 1000x cards nor when I was testing the San Disk Extreme Pro Cards. Maybe I have a bad copy? I would be happy to try my luck with a replacement; however after contacting support they will only let me return the item for a refund. Until there is more consistency with the products from this company I can't recommend purchasing anything from them. It is not about getting what you pay for it is about false advertising and misrepresentation of a product. 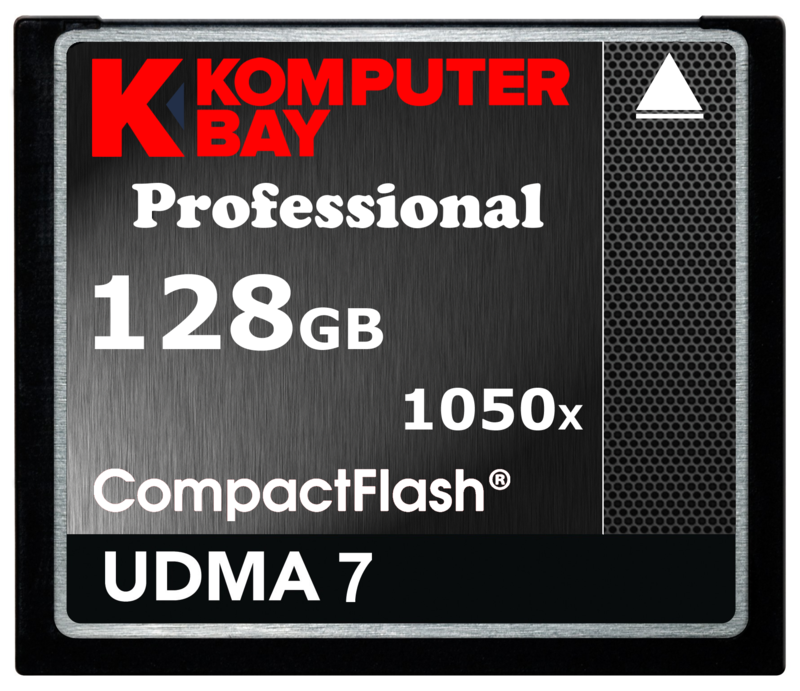 I have given 2 KOMPUTERBAY 1050X 128 Gig compact flash cards the most demanding tests in assessing whether or not it is a card I can use professionally for writing 1920 x 1080 continuous 14 bit raw video files on my Canon 5D Mark 3's. The card wrote 128 gigabytes of data without a dropped frame in continuous use at both 24 or 25 FPS. I was using Magic Lantern's alpha software with the cameras and cards. For stills or video this card met the demanding use of a professional. While using their early 1000x 128 gig card I had some dropped frames and inconsistent performance and the company refunded my purchase when the cards could not deliver. These newer cards have delivered perfectly. Great value, great performance Review by Marcello A.
I bought this a month ago and used it on my Nikon D800 to take wedding videos and RAW pictures. EDIT: Komputerbay has since replaced the faulty card and it seems to work much better. Tried the 128GB Professional COMPACT FLASH CARD CF 1000X 150MB/s Extreme Speed UDMA 7 RAW 128 GB last fall and returned due to the VERY LARGE number of corrupt images. I have a 5D mkIII. Initially, after messing with it for a very long time, I was able to get about 12 minutes with no frame drops. But, as it get closer to filling, the card slows down. It also gets very hot (many people say this is normal). I also had corrupt files occasionally, and the card froze finder and then had to be reformatted. If you have this card, I hear their kustomer service (see what I did there?) is great! I just don't have the time to send cards back and forth until I get a working one. I've had good speed benchmarks. Not always consistent but good enough for 1080p RAW on the Canon 5Dmk3. Haven't had frame drop yet..
Great card, great price Review by Stephan "Stephan"
Card went bad on me and got a warning that said "Card cannot be accessed" when put in my camera. My computer also wouldn't recognize the card. Contacted Komputerbay and got a quick reply from their tech team who said (and provided provable forums) that the card reader I was using (Lexar dual slot usb 3.0) was corrupting cards. They then recommend that I get the Kingston card reader. I sent my card to them for replacement a couple days ago, and just got an email back saying that I will be shipped a new card in 0-3 days. While it's unfortunate that my card became corrupted, I still give credit to Komputerbay for solving the problem! Works well, though 1050x claims are a bit exaggerated, Review by Brandon Li "Run/Gun/Shoot"
Used on 5dmkIII Magic Lantern Raw. I have been able to record 1920x1080 continuously, filling up the card with a single take. No dropped frames. However, I am not able to record higher framerates at or above 95MB/S (approx). Performance is about on par with Lexar 1000x cards. So far so good Review by BTO "bthomasy2m"
I knew we were taking a chance purchasing a 128GB 1050X CF Card from this relatively unknown company. We have had good luck with their 64GB CF Card so we jumped at this one and are pleased so far. Great product so far! Review by Experienced Musher "musher"